Yeah, I'd agree that a week of good playing brightens it up nicely. Reminiscent of the old saying "there's only a week between a bad haircut and a good one." On the Bathurst electrical strikers front, they could indeed be well worn. I imagine they were installed when the first clock-o-matic was installed, which might be 20 years ago, and probably not revoiced when the Apollo II replaced it after a lightning strike. I didn't think to look at them at the time (I only had three days to gather information and they were the last thing on my mind), but having done the comparison, it would be good to revoice at least the one in question and see if that solves all the problem or only part of it. I.E. are outside clappers, or too-light clappers, or too-hard clappers or improper placement also involved? I am still puzzled by the horizontal cylinder striker shape - that seems to me a short step to too wide a strike point. Why weren't they made with a curved face, like your rotatable clappers, but maybe vertical? They could have also been bolted in rather than welded, allowing rotation. Some of them have made quite wide impact marks on the outside of the bells, and that's not going to go away when the striker is revoiced. These marks seem deeper than I'm used to seeing on the inside of bells, which are usually limited to polishing away the turning marks. Food for thought there. Our paper (Fletcher et al) looked at the effects of a too large strike point - it would be interesting to follow up with effects of a strike point that was too wide vertically and one that was too-wide horizontally. If we found one of those was demonstrably worse than the other, it might lead to some rethinking about clapper shape. 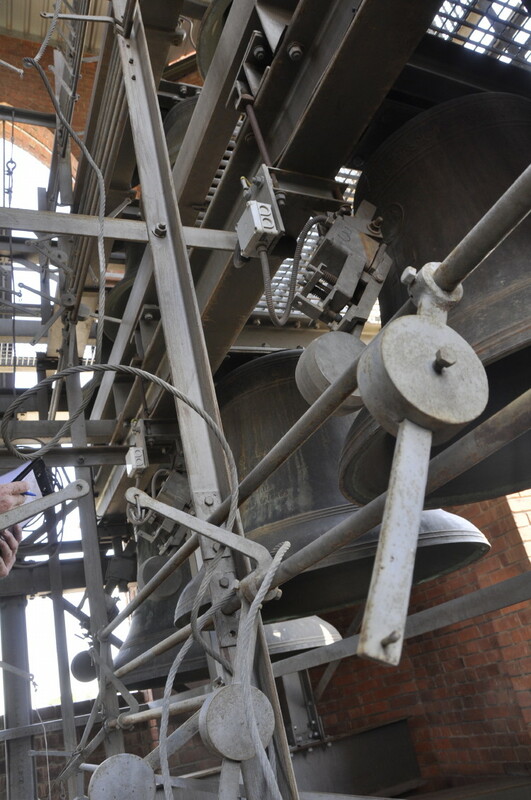 When the old trebles in Canberra were upgraded in 2002, one of the old bells (and it sounds from descriptions that it was probably around bell #26) was retained, for possible exhibition purposes. It's currently in storage. I have had in mind the notion of getting it down here for some experiments in the controlled lab environment. Not the kind of thing one tosses into the back of the car however! I'd need a winch just to get it up on the bench! Flutes are so much easier. No problem with chunks of the ball being sliced off (either horizontally like yours or vertically like Bathurst) as long as the weight is maintained. But if you look closely at the striker in the middle of this image, I think you'll see it's actually cylindrical with chamfered ends rather than a truncated sphere. That seems odd to me. The notes at centre of keyboard seem to have a very tingy tone. I see what you mean, and I agree, you are automatically going to have too big a contact area on those hammers right from the beginning. As for the Wisconsin carillon, I agree - quite clangy. That carillon had a renovation in 1984, so almost 30 years ago, and I greatly doubt that the clappers have been re-shaped since then, so that's a good example of a carillon that needs the filing we're discussing.